An Adventuresome Resort You Must Experience! Seldom is an Orlando resort an "Adventure", one that overloads your senses and overwhelms your memory bank. But the unique Gaylord Palms Resort in Kissimmee satisfies all criteria for an adventuresome resort. With or without children, this new 1,406-room grand resort offers quaint get-away areas and luxurious accommodations perfectly combined with outdoorsy, active and inter-active entertainment. In the middle of it all is the signature architectural feature -- an expansive 4.5-acre glass atrium. The massive, domed "atrium" (a word that seems too insignificant for this scale) is fully temperature-controlled throughout its four themed areas, appropriately named, "Key West", "Everglades", "St. Augustine" and "Emerald Coast." Each location offers a multi-sensory experience – sight, sounds and smells reminiscent of each region. Guests can escape to the tropics in the Key West atrium where the focal point is the S.S. Gaylord, a 60-foot sailboat floating in a 161,000-gallon wave-filled coral reef. How far you sail there, though, depends on how much you drink, because it is a lounge. The sailboat doubles as a raw bar, allowing guests to climb aboard to enjoy a cocktail. Every evening, this area of the resort explodes with activity during the Sunset Celebration, reminiscent of Key West's Mallory Square. Families will enjoy the bright colors of Sunset Sam's Fish Camp and the kids will certainly be entertained by the lively beat of steel drums, by jugglers and magicians and/or the 12-foot tall (on stilts) balloon hat craftsmen and women. In the Everglades atrium, you'll stroll along rugged wooden walkways over the foggy swamp as sounds of frogs and other creatures fill the air. You can visit the Storytelling shack for a back-woods unraveling of the mysteries of the Everglades and view "alligators" in the "river of grass" and fireflies in the trees. Do not bypass the Old Hickory Steakhouse – the resort's signature dining experience. The restaurant has teamed with celebrated New York chef Terrance Brennan to introduce a special artisan cheese course, the first of its kind in Florida. This truly European tradition is served tableside after the entrée and before dessert. More than 200 cheeses will be featured, crafted by hand from time-honored recipes. A multi-level view of the bogs, swamps and plant life certainly make this restaurant a one-of-its-kind. The Everglades also includes the Canyon Ranch Spa Club; with 20,000 square feet, it is the largest hotel spa and fitness center in Central Florida. Villa da Flora De Flora, one of the resort's three signature restaurants, features a European market of food from the Mediterranean. Chefs in six kitchens prepare seasonal market-inspired creations from France, Italy, Greece, Spain, Turkey and North Africa. The wine list features Mediterranean offerings, including sangria prepared at your table. Reflecting the architecture, natural resources, beauty and personality of St. Augustine, Fl., the Grand Atrium serves as the breathtaking focal point of the resort. Standing tall inside the Grand Atrium is a reproduction of the Castillo de San Marcos, the oldest Spanish fort in America. Guests can also explore caves adjacent to the fort and take a drink from the fountain of youth. Shopping options are numerous and unique, even for a resort this size. Highlights are a special Harley-Davidson store and a Disney Store, the only one of its kind outside of Disney resorts, Mel Fisher's Treasures, PGA Tour Shop and many others. But what is a resort without a pool? In this case, two! The Marine Pool, designed for families with children, is the perfect watery playland. The zero-entry pool features a water slide that looks like a gigantic octopus and a sand beach play area that features playful sea horse waterspouts. The LaPetite Kids Station is conveniently adjacent to this pool and offers a professionally staffed child-care and entertainment center for children of all ages. For adults, the South Beach Pool takes on an Art Deco feeling featuring glass tile and neon colors. Available for hourly or daily rental, luxury poolside cabanas come complete with free high-speed Internet access and offer a private respite for outdoor massages. 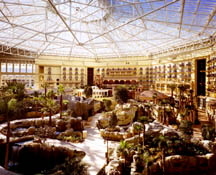 Accommodations at Gaylord Palms mirror the Florida themes found throughout. From the Emerald Bay "hotel within a hotel" which offers an upscale boutique feeling, to the colorful Key West and St. Augustine theme, to the quiet Everglades section, there's a lot to choose from. Situated on 63 acres just five minutes from the Walt Disney World Resort, the $450 million Gaylord Palms Resort and Convention Center is truly a total destination resort offering world-class meeting facilities, exceptional service and family entertainment. Gaylord Palms has also partnered with the nearby Falcon's Fire golf course and offers guests round trip transfers to the course. The 18-hole championship golf course is a welcome amenity to the resort's offerings. There is no better place to immerse yourself in ambiance of the "outdoors" than this resort. Experiencing the adventure of Gaylord Palms' environment can't be accomplished in a day. You'll need to spend a few nights, or more, and you'll leave with thirst for adventure very satisfied! For Information on this great resort, contact Gaylord Palms Resort and Convention Center at 407-586-0000, visit their website at www.gaylordpalms.com or write them at 6000 W. Osceola Parkway, Kissimmee, FL 34746. Click if you want help with flights.